UFS Explorer software is designed in a way to meet most challenging requirements of our customers. Covering all required data recovery techniques this software will recover lost data from a vast variety of data storage systems - from portable devices to complex RAID-systems and virtual machines. UFS Explorer provides support and access to various operating systems. At the same time, in response to to abundant market of operating systems there are releases for Windows, Linux, MacOS and BSD. The programs will work both on desktop and mobile, distributed and centralized as well as in virtual environments. The utilities are intended to produce remarkable recovery performance for data loss cases of any complexity - from simple file deletion by user to data recovery after complete destruction of a file system. With abundance of tools and functions organized into one efficient software, this utility will become irreplaceable assistant to specialists in need for data recovery. AMD64 (x86-64) - for all operating systems. NTFS: full support: data access, search for lost partitions, RAID recovery, deleted files recovery, recovery after format and recovery after file system damage. FAT/FAT32: full support: data access, search for lost partitions, deleted files recovery, recovery after format and recovery after file system damage. SGI XFS: full support: data access, search for lost partitions, RAID recovery, deleted files recovery, recovery after format and recovery after file system damage. Support of NAS devices and custom servers. Apple HFS+: full support: data access, search for lost partitions, RAID recovery, deleted files recovery* and recovery after file system damage. Linux JFS (JFS2): full support: data access, search for lost partitions, RAID recovery, deleted files recovery, recovery after format and recovery after file system damage. Ext2-Ext4: full support: data access, search for lost partitions, RAID recovery, deleted files recovery*, recovery after file system damage. Support of both NAS and custom servers. ReiserFS: full support: data access, search for lost partitions, RAID recovery, deleted files recovery, recovery after format and recovery after file system damage. UFS/UFS2, Adaptec UFS: data access, search for lost partitions, RAID recovery for both little-endian and big-endian variations. Recovery after file system damage. Very limited support of deleted data recovery. HFS: legacy Apple file system supported in data access mode only (copying files and folders from HFS file system). Custom RAID in Runtime VIM format via RAID Access Plugin – VIM Import. 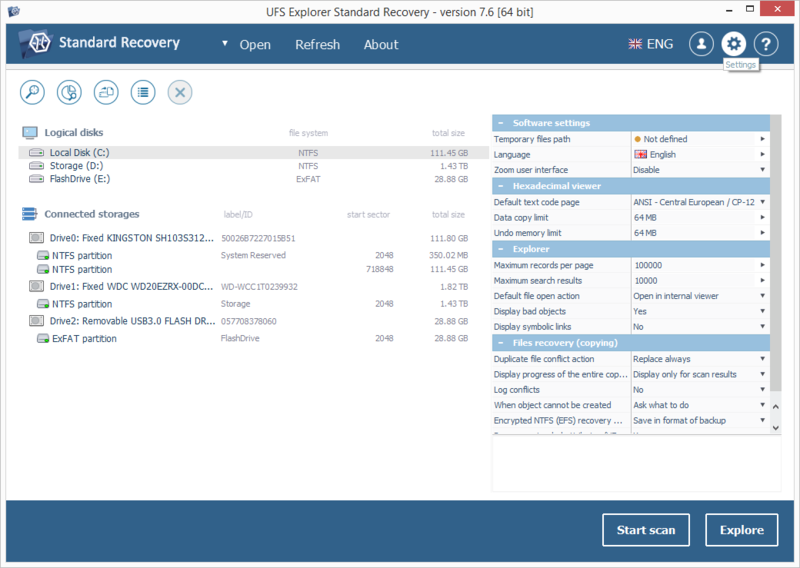 he software download page is located at: https://www.ufsexplorer.com/ufs-explorer-standard-recovery.php. Navigate to specific software edition detailed description for more information about it. This page also contains references to software update information, technical details, including specifications. Software edition specific information can be found on a specific product web page. To install new copy of the software or update the software from previous version you should follow steps of fresh software installation. If you are updating software from older major software version (e.g. from 3.x to 5.x or 4.x to 5.x) it's recommended to uninstall older software version before latest version installation. Different software editions can be installed same time. You can install software to Microsoft Windows NT 5.1 OS and later (Windows XP/Windows 2003 Server and later). It is possible to run the software on older Windows NT versions starting from NT 4 SP6. Software installation to Windows 95/98/МЕ is not supported at all. To install the software simply download software installer executable file and start it. Warning: never download or install the software to the drive with lost data you are going to recover. This may lead to permanent data damage or loss. If data was lost from non-system partitions, it's recommended to download and install software to system OS partition. If data was lost from system partition, it's recommended to shut down computer immediately and boot it using 'Recovery CD'. After start of installation process, you will be prompted for user interface language that will define language of software installer and software user manual. If software is updated from previous version installer will pick previous software language preferences. The installer will show End User License Agreement (EULA) for acceptance. On the next step software will prompt for software installation target folder. In case of software update from previous version the default installation folder will be set to the folder of previous software version. Then installer will prompt for name of “Start” menu product group (default is “UFS Explorer” or "Data Recovery"). At this stage installer will finish necessary information collection and start the installation process. After it is finished, you will be able to start the software from final window of software installation wizard. You may start the software using shortcut in “Start” menu (“All programs”, then software group (default is “UFS Explorer” or “Data Recovery”) and then “Recover data with UFS Explorer” (for UFS Explorer) or “Recover files from X file system(s)” (for Raise Data Recovery). There are no special actions required: just download compressed DMG-image files from the software web site and open it using Finder. As an option, you may copy software to “Programs” folder. Download software binary archive from the web site (for example, into “~/Downloads” folder) and extract its contents. Open the folder in Terminal application and open the folder with binaries using “cd” command (e.g. “cd ~/Downloads/ufsxsci-other”). Run “install” script as local Administrator (e.g. “sudo ./install” or “su root -c ./install”). To start the software, you may use shortcut in Window Manager main menu (under “System utilities”). If you are going to run the software as local Administrator, you may type the application start command. Download software binary archive from the web site (for example, into ~/Downloads folder) and extract its contents. Open the folder in Terminal application and open the folder with binaries using “cd” command (e.g. “cd ~/Downloads/ufsxsci-other”). Run “install” script as local Administrator (e.g. “sudo ./install” or “su root -c ./install”). To remove the software run “uninstall” script (supplied with software installer) as local Administrator (e.g. “sudo ./uninstall” or “su root -c ./uninstall”). To start the software, you may use shortcut in Window Manager main menu (under “System utilities”). If you are going to access hard drives and run the software as local Administrator, in terminal run “su root -c ufsxsci” (Standard Recovery). Activating the program means purchasing license for the full version and registering it. For more information concerning the difference between Trial/Evaluation and Full versions, go to 4.2 License Information section. You can choose among three types of license according to the purpose of using the product: Evaluation, Personal and Business licenses are available, each with special conditions of applying the software. After purchasing the license at you will get a sequence of symbols, which will be sent to the e-mail address mentioned during the purchase. Then you should start the application, if it is not started yet, press the Software license button. Enter the sequence of symbols to the gap “Registration Code”, as well as fill in the gap “Registration Name” according to the name mentioned in the payment document as a buyer. After valid data is supplied, the software should switch to “Registered” mode and remove trial limitations immediately. make sure the registration code is copied as described above. To upgrade your software version to a newer one, go to https://www.sysdevlabs.com/de/store.php, download the upgraded installation pack of the needed software pack and simply run it as mentioned in the Setup section. You will not need to enter the registration code again, if you have one, as the application remembers it. In case when your software version is up-to-dated, the installation manager will show the according message. - For Windows users: use standard “Uninstall” feature under “Programs and Components” of Windows Control Panel. 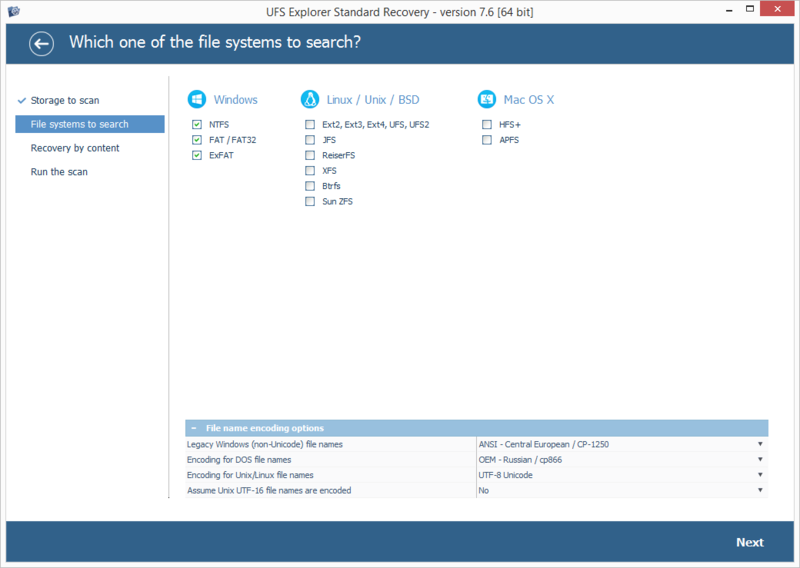 The software name for removal is “UFS Explorer Standard Recovery”. - For Mac OS X users: simply delete it from disk. - For Linux users: To remove the software run “uninstall” script (supplied with software installer) as local Administrator (e.g. “sudo ./uninstall” or “su root -c ./uninstall”). As already mentioned in sections 1.1 Overview and 1.3 Features, is a professional tool for lost and deleted data recovery (after deletion, format, malicious software actions, data damage after hardware or software failure etc.) and is intended to be used by specialists in data recovery. The software contains tools for automated data analysis and data modification that means incorrect actions with the software may lead to permanent data loss. In this section software usage peculiarities are described providing examples and useful tips. In case if you have questions concerning the implementation of some of the procedures, please go to the Appendix section to check whether the question is already answered there. Software can be started before prior setup. After program is started you will be able to change software settings for more efficient software use. Software settings are available on the “About/Settings” user interface tab. Value can be changed by pressing “Change value” button next to the value. Software settings will be stored under user profile folder in special “,ufsxsci,hbin” file. The software will not save any data into operating system registry or configuration files (except software uninstall information, if applicable). Defines folder for “Quick view” tool of Explorer. The software will write all the temporary files into this folder More information can be found in “Explorer” description. The changes will take effect immediately. Allows to change user interface language. It does not apply changes to User Manual. You should restart the software to make changes to take effect. Defined default encoding for hexadecimal viewer to display symbolic byte representation. This section also defines maximum number of bytes to copy via system clipboard and maximum number of bytes to use for “undo” in hexadecimal editor. Settings include maximum number of objects available on single “page” of Explorer and maximum number of search results returned by single search operation. Lower values will save memory and increase speed, higher values will allow to operate more objects. The recommended settings are available in hint section (select field header to see). The changes will be applied to any next related operation. Additionally, it is possible to set up default action for file “Quick view”: the actions include opening in hexadecimal viewer or file copying to temporary files folder and launch using default associated application. After software is started it displays main window that includes main menu (top), navigation tree (left) and workspace (right). By default, workspace will display “About/Settings” tab. Simple data access does not require special knowledge: to access a file, activate required disk partition in navigation tree and software will display “Explorer” tab for the chosen file system. Use explorer-style navigation you may navigate to a specific folder, find and select required file and save it using “Save current selection” tool from explorer tab main menu or using “Save this object to...” context menu option. The file can be also “opened” just by activating it by keyboard or mouse. This will either copy file to folder defined as “Temporary files path” and opened with default associated program installed on your computer or opened in new “Hexadecimal viewer” tab depending on your preferences. The tree contains top-level container “This computer”, containing all the opened storages below. The storages will also include disk images and complex storages (RAID). The “Open” tool in main menu and context menu of “This computer” element allows to open any of supported disk image or virtual disk. More information about supported formats is available in the software specification. The “Open storage” tool in main menu allows to open physical storage by specifying OS-specific device name. In Microsoft Windows, you may open volume by supplying volume mount point (e.g. “E:”). To access physical drives, you must run the software as local Administrator. The “Close storage” tool allows to close the storage in UFS Explorer. The “Refresh storages” tool resets tree of attached storages (closes all the opened storages and re-detects attached storages tree). This does not close already opened tabs. The storage is closed after last tab to a storage is closed. After refreshing, the tree will only contain available physical drives, excluding any disk images or RAID. In case OS used software RAID, it will be displayed as set of its components. To open such RAID use “Open device” tool and open the RAID by specifying device name or mount point (such as “E:” under Windows or “/dev/lvm/vg0” under Linux). The contextual tool bar for disk contains tools for lost partition search and definition as well as to save disk content to an image file. A disk may be divided into “disk partitions”. Purpose of disk partitions is data isolation (from other data or OS), different OS installation on the same physical disk etc. The software will show disk partitions under “disk” element (including those with unknown or unsupported file system). The partition name consists of combination of its parameters: file system type, offset, size (in GB). More details about disk partition can be found on disk properties tab. The file system icon will indicate its condition: green means file system can be accessed, yellow may indicate problems, red means there are problems and gray means file system cannot be recognized. It does not display any information about file system mount point. For example, drive “C:” may be displayed simply as NTFS-formatted partition of required size. File system can be identified by disk and file system size, as well as by its files/folders content. After partition activation software opens “Explorer” tab for the file system. If you suspect disk defects, it's strongly recommended to save a disk image file for further data recovery from disk image file. For this there are “Disk image”/“Partition image” tools for “Disk” and “Partition” elements available in element context menu and contextual tool bar. This makes bit-to-bit copy of disk (or partition) contents to an image file. There is an option to save partial image file (selected data range). Entire disk image file can be opened with “Open” tool and software can use it for data recovery instead of original disk. The software allows to define missing partition both manually and by automated scan. In first case, you may use “Define partition” tool from disk contextual tool bar. The software will suggest entering partition start sector and its size (in sectors). If that specific offset contains any valid file system, the software will be able to automatically adjust disk partition size. If the software is unable to find valid file system at the given offset, the software will warn about this. The lost partition automated search is available through “Find partition” tool. It opens lost partitions manager dialog that allows to scan the disk for lost partitions in automated mode, save scan result or restore previously saved scan result. If new scan is started, software will ask for disk range to scan and file system types to detect. When scan is started and file system of given type is detected, software adds it to list of found partitions. Icon color will indicate the same partition state information as in the main form. To add partitions to UFS Explorer disk partitions tree you must select partitions with checkboxes and press “Use selected”. Important: information about partitions that were not selected will be lost if you have not saved partitions list to a file. After selecting disk partition the software will open Explorer tab for the file system. In case software did not recognize file system, it opens Explorer window and starts "Data Recovery" wizard automatically. Files and folders in Explorer are represented as sorted lists, containing file/folder name, type, size and modification date. You may re-sort the list by clicking to column header. To simplify navigation Explorer contains quick navigation panel with support of navigation by navigation history, navigating to parent folders or by typing full path. Left side of Explorer panel contains folders tree. When folder is activated, software navigates to the folder. When file is activated, software depending on preferences will either open it in hexadecimal viewer or will copy into folder for temporary files and will open with installed associated application. Files and folders can be saved to a specific “local” folder by selecting them and choosing context menu option “Save this object to...” or using “Save selection” tool in the tool bar. You may select several objects in Explorer for copying by holding “Shift” or “Ctrl” keys when selecting object in list. If you require more complex rule to copy files, use “bulk copy” operation. If the number of files and folder exceeds maximum number specified in software settings Explorer will use “Pages” to show all files. In the tool bar, it activates buttons for “Previous” and “Next” pages navigation and button for navigation to page by given number. To copy all the data from such folder you may either use “bulk copy” operation or apply copy operation for parent folder. The option is activated by “Define selection” button of Explorer panel. This turns both files list and folders tree to “checkbox mode” to select files and folders for copying. - if folder is selected, it will be copied with its content except deselected files and folders. After all required files/folders were selected, press “Copy selection” to start copying process. Selection can be canceled using “Cancel selection” button. The function is available as “Quick search”: just specify sub-string of file name to search on quick search panel or as “Advanced search”: the tool in the tool bar, folder context menu or “Ctrl+F” keys combination. Quick search uses string as a part of file name and uses case sensitivity settings of the current file system. 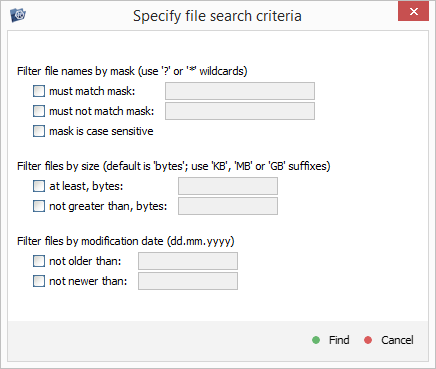 For Advanced search, you may specify full mask for file name (including “wildcard” symbols * and ?). You may also define rule for file size and for inclusion of files and folders to search result. Search operation will start on a new “Search result” tab and runs over all sub-folders of the selected folder until all sub-folders are processed or maximum number of found objects is reached. New search will start on the same tab if previous search operation is completed and “open on new tab” option is not specified. You may navigate from “Search results” tab to “Explorer” tab opening folder containing selected object. The software will not copy files/folders from search results tab. 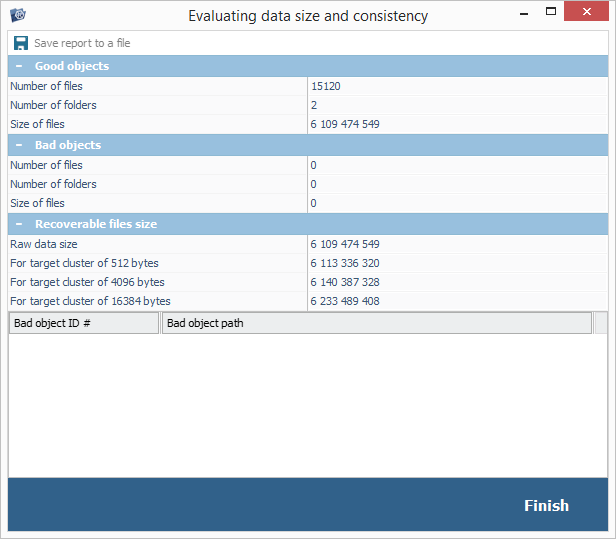 Before you start copying files and folders, it's recommended to evaluate data size to select matching target storage. You may use “Evaluate data size” tool available from folder or objects group context menu. If file system consistency error is detected, it's recommended to continue with file system recovery. The panel contains information about currently opened partition, file system and folder for fast navigation. If folder is chosen in the left panel, it will be opened in Explorer; this feature can be used for fast navigation through different folders. Folder context menu contains all the tools available in Explorer for folder record. If Explorer is in “bulk copy” mode, you may select/deselect folders from tree by double-clicking them. If the file system was scanned with data recovery scan, scan result will be available as a “file system instance” under partition item element with its own subfolders tree. Lost files recovery is the main purpose of the software. Search for lost file systems was described in the section Defining missing partitions. This section describes recovery of lost and deleted files (including recovery of user-deleted files, recovery after format, file system damage etc.). 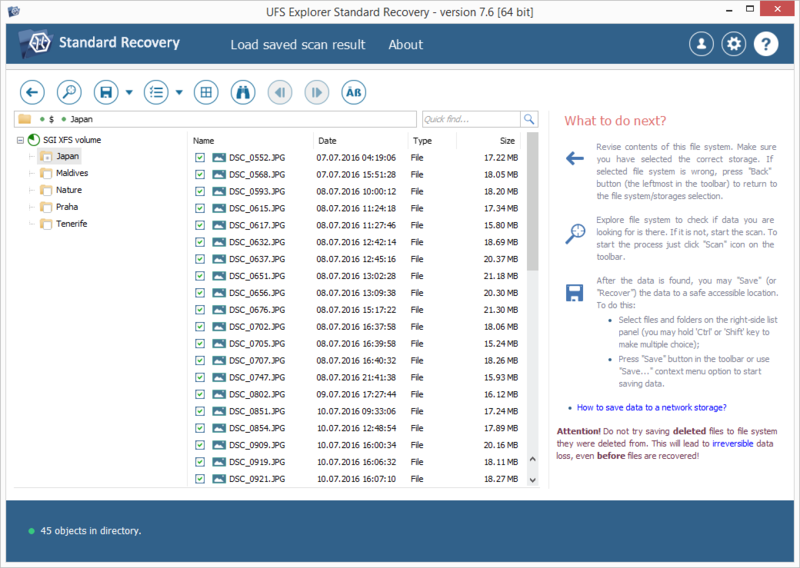 Lost files recovery is available as a tool “Recover lost data” in partition context menu or “Recover” button in Explorer. The panel contains information about currently opened partition, file system and folder for fast navigation. If folder is chosen in left panel, it will be opened in Explorer; this feature can be used for fast navigation between different folders. Folder context menu contains all the tools available in Explorer for folder record. If Explorer is in “bulk copy” mode, you may select/deselect folders from tree by double-clicking them. If the file system was scanned with data recovery scan, scan result will be available as a “file system instance” under partition item element with its own subfolders tree. After general parameters are defined, you must define scan preferences. These settings could be different for different file systems depending on file system specifics. These parameters may include search for deleted files, IntelliRAW scan stage etc. For some file systems, the software offers “force sector-by-sector scan” mode that is recommended to enable after file system format. Scanning of a file system may take significant amount of time. 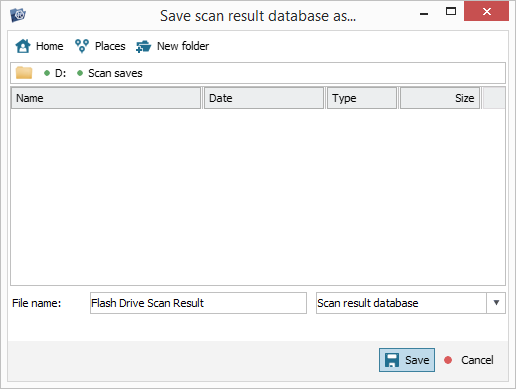 After scan is completed, the software will turn back to Explorer and show the scan result as a new “file system instance” opened by default. To prevent loss of scan result caused by software or hardware failures, it's strongly recommended to save scan result project. If you save scan result, you won't need to scan the storage once again that could be of significant importance for large and slow storages. The tool is available in the tool bar, as well as action will be suggested just after scan is completed. If you need to resume recovery after software restart, you will be able to simply load the scan result. This option is available from partition context menu as “Load recovery scan result”. The scan result is available to browse and copy files just like an original file system. This means required files and folder can be saved using all the same tools available in Explorer. Important: never save just recovered files to the source storage. The file data (contents) for recovery is still read from the source drive; this means the software may overwrite file contents. Use separate storage to recover the data. 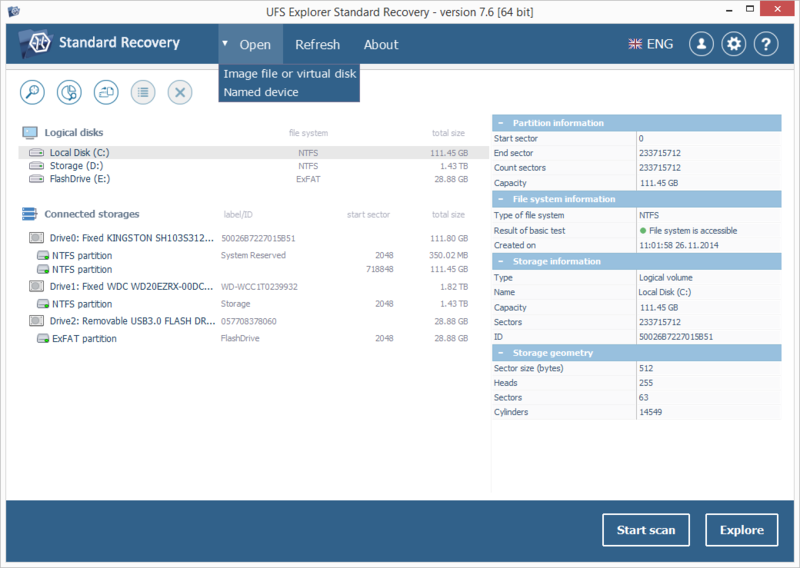 UFS Explorer Standard Recovery implements all RAID recovery related functions, they do not require any prior activation and are fully available in trial. Other software editions support RAID recovery only via optional external RAID Access Plugin - RAID Builder module. 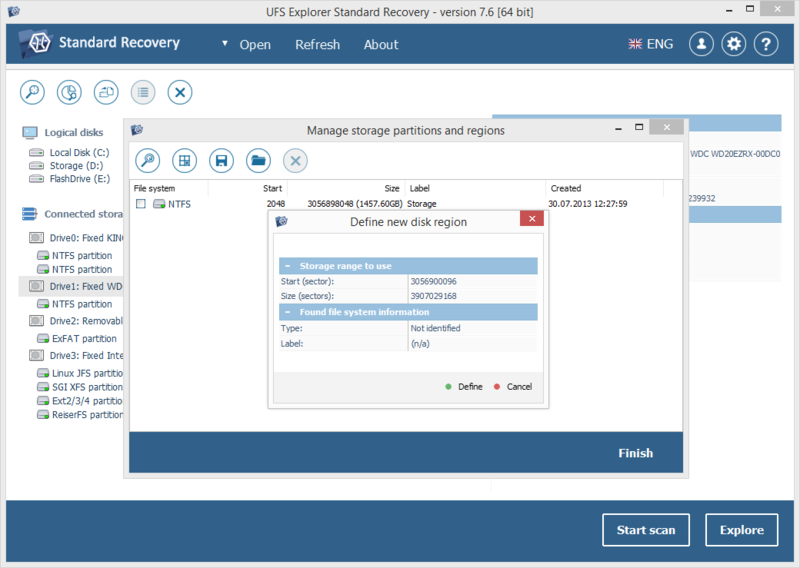 The tool is available in main menu of the first form of UFS Explorer Standard Recovery as “Build RAID”. In other software editions RAID Builder can be invoked though external module as “Plugins”-> “Build complex (RAID) storage”. RAID Builder displays new “Build RAID” window that contains main menu, list of available components (left), list of RAID components (right) and RAID properties sheet (bottom). To build a RAID you should enumerate all its components in the components list, set up RAID parameters and press “Build” button on the tab toolbar to add RAID to UFS Explorer storages. For RAID5 reconstruction without single drive is supported; for RAID6 – even without two drives. This still requires component specification as Virtual disk placeholder to build RAID correctly. Incorrect RAID configuration in UFS Explorer does not modify on-disk RAID configuration, however, makes data recovery with such configuration impossible. To start data recovery, you must build RAID correctly first. You may perform any number of RAID reconstruction attempts with UFS Explorer because it does not modify data on the source disks. All opened disks or disk images are available on the left panel and can be used as RAID components. To add disk or disk partition to RAID as a component simply “activate” it or use “Add to RAID” menu tool. If you have added a wrong component, select it in the list and press “Remove” button in the RAID Builder toolbar. To add placeholder for a missing drive (only for degraded RAID 5 or RAID 6) press “Placeholder” button. And finally, to correct order of storage components, you may select item and use “Move up”/“Move down” buttons to set correct ordinal position for selected component. If storage component has incorrect size or you must adjust start position use “Edit range” tool. The user interface behavior section of properties sheet defines how to filter list of available components (show disks or disk and partitions; show all disks or only not added to RAID etc.). You may use any source materials to find correct RAID components (RAID board BIOS information, configuration files, on-disk structures etc.). Anyway, you should specify correct RAID parameters to recover intact data. Different RAID levels use separate settings. The RAID builder properties sheet adapts to selected RAID level and allows to specify only required RAID parameters. For RAID 6 there are additional parameters (related to redundancy algorithm and distribution) and they should be specified only in case RAID is reconstructed with missing (failed) drives. Some RAID configuration can be parsed by the software and software can build such RAID in semi-automated mode. If any of good components of such RAID is added the software suggests building RAID automatically. On success, the software loads RAID components in right order and full set of RAID properties. In case of failure (e.g. in case of RAID configuration damage) you may cancel automatic RAID reconstruction and build RAID manually. In case of successful RAID reconstruction with UFS Explorer Standard Recovery it will be added as a new storage in the storages tree. You may apply all the operations available for other storage types to RAID (including adding RAID as a component of other RAID). In Standard Recovery and Raise Data Recovery editions this requires activated RAID Access Plugin – RAID Builder module. If the module is not activated, it will ask for activation. In case of unsuccessful or canceled activation the module will not add RAID to UFS Explorer. RAID Builder has quick preview tool for RAID that can be useful for quick RAID parameters evaluation for accuracy and trial RAID Access Plugin - RAID Builder module. The tool is available in main menu toolbar and allows to preview partitions located on the RAID as well as file system structure. UFS Explorer products are licensed, not sold. This means that the Software Legal Owner (LLC SysDev Laboratories) only grants you some rights to use the software. Please read End User License Agreement for more information about software licensing. The Software Legal Owner grants you a life-time license for UFS Explorer products (see p.10 of EULA for details). Software update policy is the subject of End User License Agreement. The End User License Agreement is a Public Offer Agreement. Any use of the software (including copying, installation, exploitation etc.) means you have accepted the Public Offer Agreement. From the moment of acceptance, the Agreement comes into legal force in most countries worldwide. Only LLC SysDev Laboratories, software Author and authorized resellers are authorized to issue Registration Codes for applications that are property of LLC SysDev Laboratories. Unauthorized Registration Code use is violation of the Ukrainian and international Copyright Laws. Any publication of Registration Code by License Owner or unauthorized license transfer result in End User License Agreement termination. End User License Agreement is a Public Offer Contract that has legal force in Ukraine, Russia and other countries. By installing and using the software you accept this Public Offer. Violation of EULA can be considered as a crime in these countries. 1. Evaluation License - the Software can be used by a single person for evaluation purposes only. License Owner shall agree to "trial limits" of the Software. 2. Personal License - the Software can be used by a single private person (individual) for non-profit use. License Owner is not authorized to provide any "for-profit" services using the Software. 3. Business License - the License is applicable for using the software by an enterprise or individuals on up to 10 (ten) computers owned by License Owner per single License and/or for profit use. Software cannot be installed to computers of third parties (e.g. customers of License Owner). Personal license and Business license require license fee payment. After the purchase of Software License SysDev Laboratories authorize it by issuing Software Registration Code. This code is used to unlock program functions (remove "trial limits") and identify License Owner as authorized owner of Software License. Personal License Registration Code is issued to Person's First and Last name; it authorizes Person to use application by himself/herself only. Business License Registration Code is issued to either Company's name or Person's (entrepreneur) name and authorizes the Person/Company to use the application according to Business use. To contact our support team, please visit https://www.sysdevlabs.com/de/contact.php and fill in the contact form. This section describes the main terms and notions needed for understanding the peculiarities of working with the software. RAID (Redundant Array of Independent Disks) is a special technology for data storage organization where several separate disks is combined to constitute one system. In such a system, as compared with traditional linear storages, the data is distributed across the drives in a way typical for certain RAID level. Each has its advantages and disadvantages, but the main idea of any RAID is a balance between maximum performance, increased reliability and full capacity of useful storage space. An operating system detects RAID as a single drive giving it its own mount point and treating all its disks as one and the same storage. All responsibility for correct system work is on RAID controller, which can be either hardware or software. - JBOD, which is not exactly RAID, as you trace no signs of redundancy or increased fault-tolerance here. Generally, this is Just a Bunch of Disks (not obligatory of the same size) combined to consequently store data as the disks are filled one after another. This technique is also called disk spanning. Yet, the cost varies. - RAID0 is based on data striping without redundancy. Each disk in the system is divided into separate segments – stripes. During writing, the data is cut into pieces equal to the stripe size and takes the disk stripes simultaneously: while one data part is still being written, the system starts input of the next one. In general, RAID 0 is the fastest in terms of input/output, but the least fault tolerant one. If any disk out of such a system happens to fail, all other data becomes unreadable. However, the speed is advantageous. - RAID1 applies mirroring method. During write operation, the system creates an exact copy of the data on another drive. If one disk fails, the other one remains readable. This method has the highest level of reliability and the most expansive disk capacity, though. Disks work in pair only: the system stops working completely without all drives being in operation. RAID 1 is perfect where data backup is of vital importance. - RAID3 is the first to use parity. In combination with data striping like RAID 0, this system has a separate dedicated disk that stores parity for other disks. Due to its byte-level writing and separate disk to calculate and write the parity on, RAID 3 has not much to boast of in terms of speed. Such a scheme ensures system security, yet at expense of slow operation. For this reason, RAID 3 is not very popular. In case of failure, data is retrieved by intact disks and parity. - RAID4 has the same scheme as RAID 3 (i.e. striping with dedicated parity) with one distinction: while RAID 3 operates at a byte level, this one handles data at a sector level. As a result, this resolves a write issue to some extent. Nevertheless, faster and more reliable RAID 5 has replaced RAID 4. As with RAID 3 this level is recovered by remaining disks plus parity disk. - RAID5 takes the principles of basic data striping similar to RAID 0 and redundancy of RAID 3, but is more progressive in its technology than its predecessors. Now no separate disk is dedicated to store parity information and it’s rather distributed among all data disks following special rotation schemes. This method speeded up writing, as the system doesn’t have to wait until the parity is calculated on a separate disk. If any of the drives fails, the data will be retrieved from the remaining drives and parity. - RAID6 is a further step into higher reliability. This method implies two layers of parity distributed across all disks following special order and rotation schemes. Compared to other levels, RAID 6 allows for data recovery with two drives missing. This scheme is the most reliable one but the least cost-efficient, as plus one drive is used to store parity. In this section, most common users’ questions are being answered. For any further information, please contact the developers of the software directly via contact form at: https://www.ufsexplorer.com/contact.php. Does software modify data on the source drives? Source drives are opened as read-only so software is unable to modify the data. However, this software edition contains tools for explicit data modification. Any incorrect use of these tools may lead to permanent data loss. What file system is on my storage? If file system is supported by UFS Explorer it will be shown as “NTFS partition (sector 2048, 40 GB)”. Here “NTFS” is file system type. Does it support an X file system? This information is available in the software specification. Anyway, this can be checked by running software trial. How to identify partition in UFS Explorer? Find the drive and file system of specific size. Anyway, you may open file system in Explorer and check it by contained files. Windows dynamic disk was not recognized by the software. Where is problem? The software is likely to have defined complex dynamic disk (e.g. span, stripe, RAID 5 etc.). UFS Explorer does not assemble RAID automatically. If such RAID is mounted by Windows as a volume, you may open it as a “storage device” by specifying its mount point (NTFS path or drive letter followed by colon). Data is stored on software or hardware RAID not recognized by OS. How to access the data? 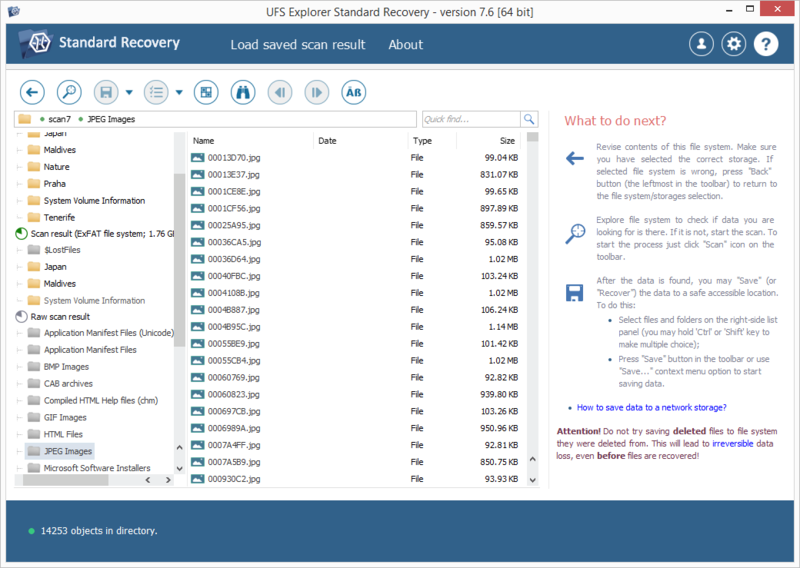 UFS Explorer Professional Recovery supports virtual RAID reconstruction and uses such RAID as virtual storage to access the data. The disk image file is split into many fragments. How to access the data? Entire disk image can be combined from fragments using free RAID Access Plugin – Autospan module or via RAID Builder (span mode). There are bad clusters. How to read the data? If data is very valuable, it's better to contact data recovery service laboratory for data recovery. If data costs less than data recovery service fee, you may use the software to attempt data recovery. If there are file system errors, it's recommended to use file system reconstruction tools of UFS Explorer. Anyway, it is strongly recommended to access the data from such drive only via free “Read-It-Once plugin”. External drive was not recognized, what are my steps? A: Check data cable connection type and if there is enough external power for drive (e.g. 3.5' drives can not be powered via USB). To make software to detect the drive, make sure OS can recognize the drive as a device. In Windows: right click “Computer” choose “Manage”. Go to “Storage” and “Disk management”. Make sure disk is listed. In Linux and Mac OS there are “Disk utility” in system applications section that can be used for the same purposes. Important: if you have connected disk from other OS to a computer with Windows OS, it's possible it may ask for “disk activation”. Decline this prompt to prevent data loss. The OS recognizes disk but not UFS Explorer. What to do next? Make sure software is started using local Administrator user account (this is required to access physical drives). If other disks (except required) are detected, this may indicate bad cluster on sector 0 of the drive. In this case, disk still can be accessed via “Read-It-Once Plugin”. closes the selected component in the data comparison, parallel search, data span tool, RAID Builder and parity calculator tools. moves the cursor backwards on the positions that were under cursor location. moves the cursor in the forward direction on previously selected positions. moves the cursor in forward direction on parallel search results. breaks off current structure template. applies a structure from the list of imported structure templates at a current cursor position. allows creating a new virtual disk using space-saving “sparse file” technology. cuts all data after the cursor position and makes cursor position the last byte. allows creating and saving several data chunks from the data source. allows setting parameters for parallel data values search. Possible search variants include hexadecimal values search, text values search and advanced hexadecimal search. opens a dialogue for saving user information about the position. Current position will be added to the positions list. moves the component downwards in the components list. assembles current RAID configuration in the UFS Explorer Standard Recovery program. The software opens the assembled virtual RAID storage in a new hexadecimal viewer tab for further operations. allows searching data with preset user-defined parameters. This includes search within text data field, search within hexadecimal data field and advanced hexadecimal data search, which gives more precise results. moves the cursor in backward direction on parallel search results. allows changing positions by setting position location parameters. copies selected data from the hexadecimal pane. hides information panel. To expand information panel, press the tool button once again. moves the cursor in the forward direction on the data difference positions detected by the software. interprets highlighted hexadecimal values in little-endian order as an address for jumping to a new position. Data values can be set in a range from DWord (2 bytes) to Qword (8 bytes). switches the current data source to data editing mode. The software creates a new editing tab for data modification operations/allows changing values of the selected data range in a manner opted by the user. allows specifying data range for further operations including actions in viewer tab, editing tab and software tools. saves modifications made to data. allows applying structure templates to data at current cursor position. To load a new structure from a text file select Import in the structure templates dialogue. Data structure details are displayed in the Structure details window and in the Information panel. Please, refer to Software forum for more information on how to create a structure template file. allows adding a file to the data end and merging several files into one. copies selected data from the text pane. interprets highlighted hexadecimal values in big-endian order as an address for jumping to a new position. Data values can be set in a range from DWord (2 bytes) to Qword (8 bytes). moves the cursor in the backward direction on the data difference positions detected by the software. opens the list of all marked positions. In this dialogue, you can save the current positions list and load it in later references. To save new positions to already existing list, create a new list file. If you open several list files, they are merged into one list. Go to button will address you to the selected position. allows moving backward on positions from the list of marked positions. copies selected text data in one-byte UTF-8 encoding. pastes clipboard contents in a manner opted by the user. allows moving forward on positions from the list of marked positions. copies selected text data in two-byte Unicode encoding. moves the component upwards in the components list. pastes clipboard contents to the cursor location. If the cursor is set at the last byte, the software gives an option to append the data to the file end or insert it before the last byte. deletes selected data area/ removes the selected data area from the data span.